Tal Sela and Arkadi Vigalok, School of Chemistry, Tel Aviv University. Chemical reactions are typically followed by lengthy and tedious products separation and purification for their identification by NMR and high resolution mass spectrometry (such as with QTOF). However, with this procedure no information is obtained about the synthesis yield, products purity, availability of isomers and on the reaction mechanism, since the already-purified compounds are analyzed and since ESI has non-uniform, highly compound dependent ionization yields. In order to enable semi-on-line monitoring and optimization of organic chemical reactions we used the Aviv Analytical 5975-SMB GC-MS with Cold EI as described in a previous post in the blog. The 5975-SMB GC-MS with Cold EI (EI of cold molecules in supersonic molecular beams) was used with reaction mixtures without their prior separation and purification as required for NMR analysis, thereby saving time and effort. GC-MS with Cold EI was demonstrated to significantly extend the range of compounds amenable for analysis, practically always giving molecular ions, enabling effective fast GC-MS analysis and providing elemental formulas via isotope abundance analysis with unit mass resolution quadrupole MS. In addition, it uniquely provides uniform response to all compounds, a feature which is vital for the measurement of chemical reaction yields. We are aware of the fact that a system of this kind is typically placed in a separate laboratory and operated by a dedicated operator thus may not be fully available for the simultaneous repetitive monitoring of several reactions. Our goal is to convert the concept of semi-on-line reaction monitoring for its optimization into a widely used concept and technology that is shared and used by students and non-expert analytical chemists. As a result, we refined and further improved the concept of reaction monitoring by the 5975-SMB GC-MS with Cold EI to be followed by the use of a walk-by GC-FID for enabling frequent semi-on-line monitoring of the reactions by the organic chemistry students. Accordingly, the 5975-SMB provides the identification of all the reaction mixture components and their order of elution and elution times while the GC-FID can have the same column, column flow rate and other related method parameters and later serve for the quantitation of the reaction products and for its optimization. Keep reading to find out how the Aviv Analytical 5975-SMB GC-MS with Cold EI followed by a standard GC-FID can change the way organic synthesis is performed. The reaction shown in Figure 1 is performed on the surface of water or in water, which affects the reactants environment and therefore the ratio of products A and B. We used the 5975-SMB GC-MS with Cold EI to identify the reaction mixture as demonstrated for product B in its Cold EI mass spectrum while GC with a flame ionization detector (GC-FID) was later used with a similar method for the desirable reaction exploration and products optimization. As shown in Figure 2 the ratio of products A and B can be controlled via the addition of salt that favored the yield of product B. Figure 1. Green chemistry on water, monitored by the 5975-SMB GC-MS with Cold EI. Upper trace is a typical Cold EI mass chromatogram of the reaction mixture while the bottom trace is the Cold EI MS of product B. Figure 2. Green chemistry on water followed and monitored by a walk-by GC-FID. Right trace is a typical GC-FID chromatogram of the reaction mixture obtained without organic salt while the left GC-FID chromatogram demonstrates the effect of adding salt on the ratio of products A and B. Products A and B, as well as the reactants, were identified by the 5975-SMB prior to the salt effect studies. We used the Aviv Analytical 5975-SMB GC-MS with Cold EI to enable semi-on-line, monitoring of reacting compounds and products mixtures, followed by a simple GC-FID that was operated as an unsupervised walk-by analytical instrument by the organic chemistry student for the quantification of the already known reaction products. A full description of the use of GC-MS with Cold EI for the optimization of chemical reactions with few examples can be found in A. Amirav, A. Gordin, Y. Hagooly, S. Rozen, B. Belgorodsky, B. Seemann, H. Marom, M. Gozin and A. B. Fialkov, "Measurement and Optimization of Organic Chemical Reaction Yields by GC-MS with Supersonic Molecular Beams" Tetrahedron 68, 5793-5799 (2012). The technology of GC-MS with Cold EI is reviewed by A. Amirav, A. Gordin, M. Poliak, and A. B. Fialkov, J. Mass Spectrom., 43, 141-163 (2008). The green chemistry reaction is further described in T. Sela and A. Vigalok, "Salt-Controlled Selectivity in on Water and In Water Passerini-Type Multi-component Reactions" Advanced Synthesis & Catalysis 354, 2407-2411 (2012). The 5975-SMB GC-MS with Cold EI is highly suitable for the optimization of chemical reactions since it is uniquely characterized by: A) Having significantly extended range of compounds amenable for analysis due to its use of high column flow rates, short columns and fully inert ion source; B) Having uniform response without any ion source peak tailing; C) Provision of trustworthy enhanced molecular ions to the vast majority of all compounds; D) being highly compatible with isotope abundance analysis for the provision of elemental formulas; E) Compatibility with fast and ultra fast GC-MS analysis. 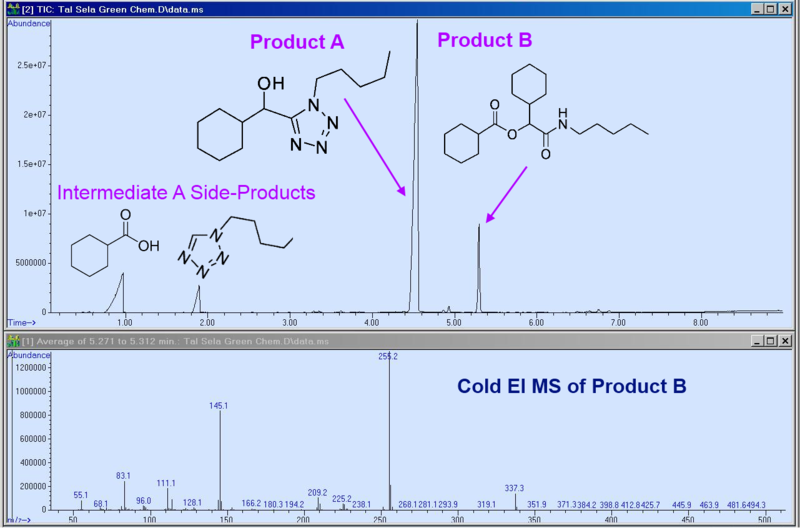 The use of GC-MS with Cold EI for identification followed by the use of a Walk-By GC-FID for quantification enables effective use of this analytical technology for careful optimization of organic reaction products while by-passing the lengthy steps of synthetic compounds separation and purification for their NMR analysis, thereby resulting in having fast, small scale and careful reaction yield optimization.